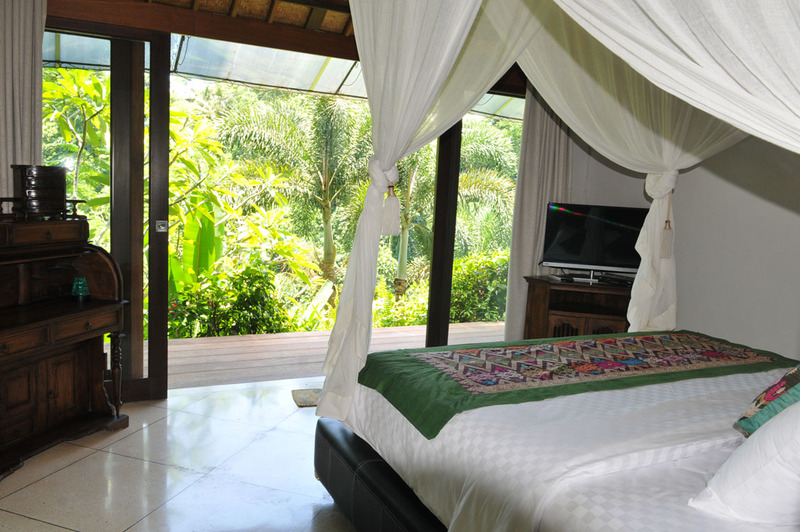 From $ 670AUD per night We have direct contracts with most villa owners. We don't add any booking fees. We are 100% transparent with no nasty surprises. 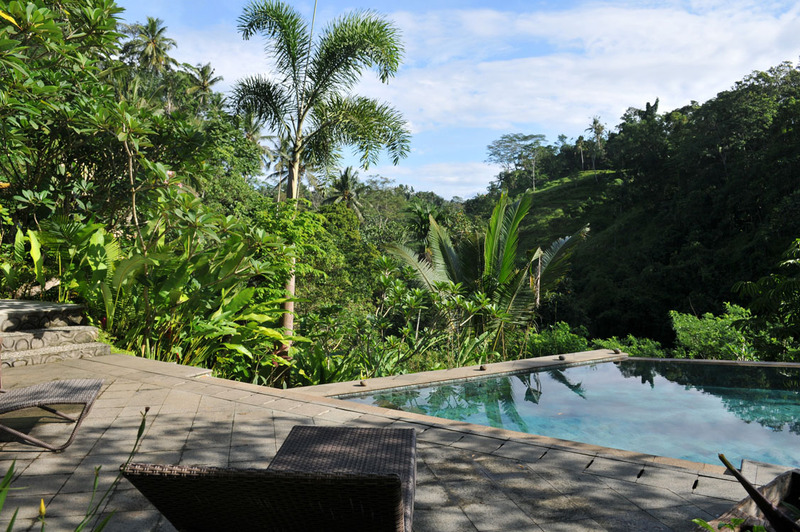 Peaceful Bali villa with sensational views - rent this now! 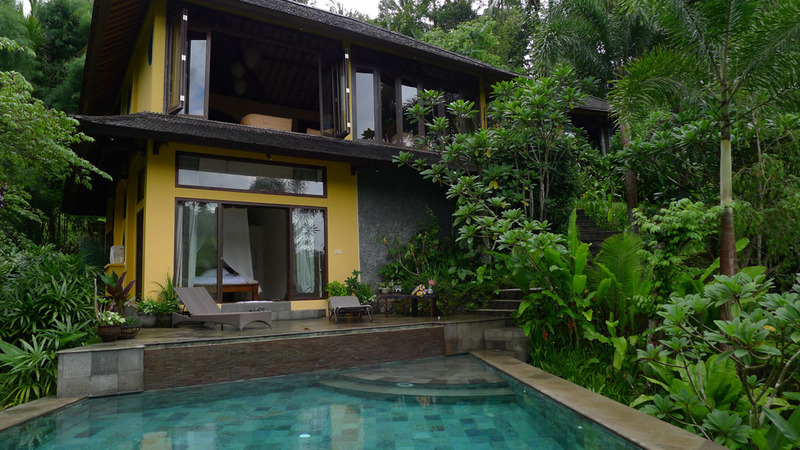 One of Ubud’s top villas. 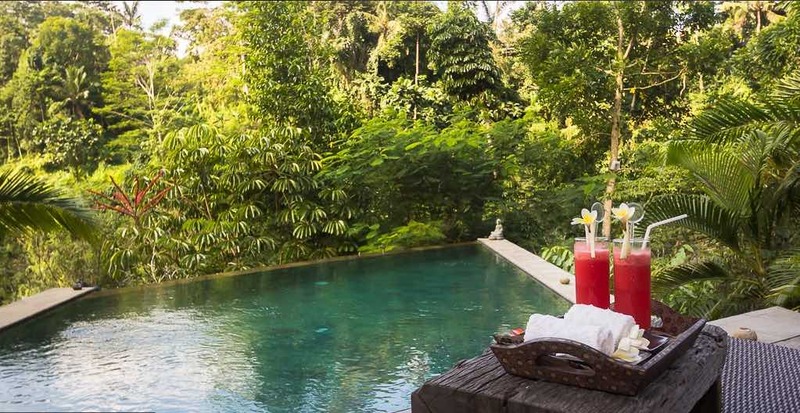 Sitting on 3,100sqm of gorgeous land, Villa Umah Shanti is a 3 bedroom Ubud villa holiday rental & is peaceful, intimate and luxurious villa located in the tranquil and laid back Ubud area of Bali. 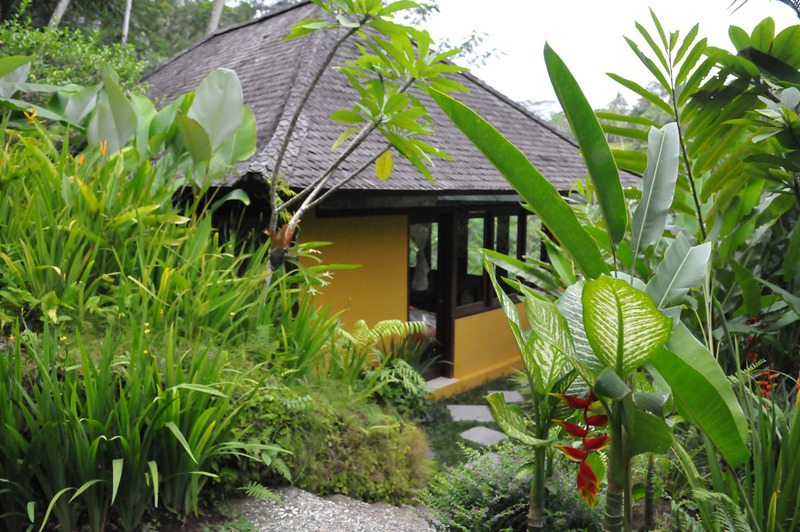 The Mas River Valley forms a backdrop for the villa and guests will surely love the sense of tranquility and serenity that engulfs the villa. As soon as you arrive you are going to feel the stress layers melt away. 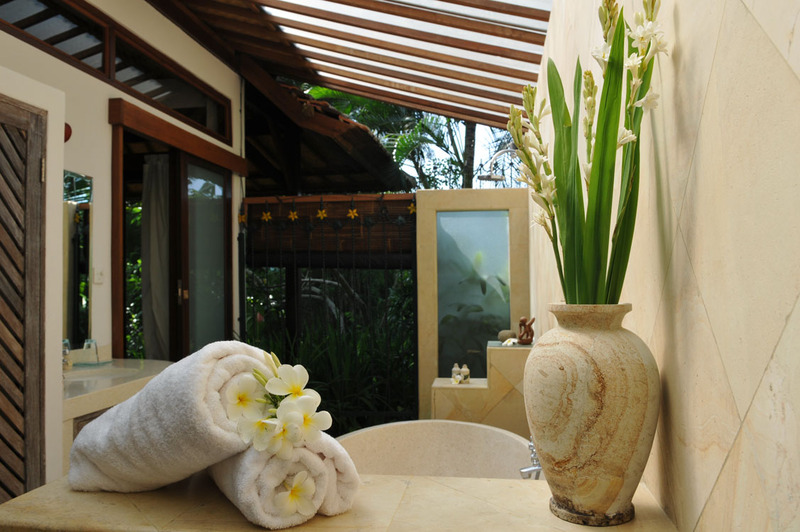 The villa has a real calming effect and this is what makes it so popular. 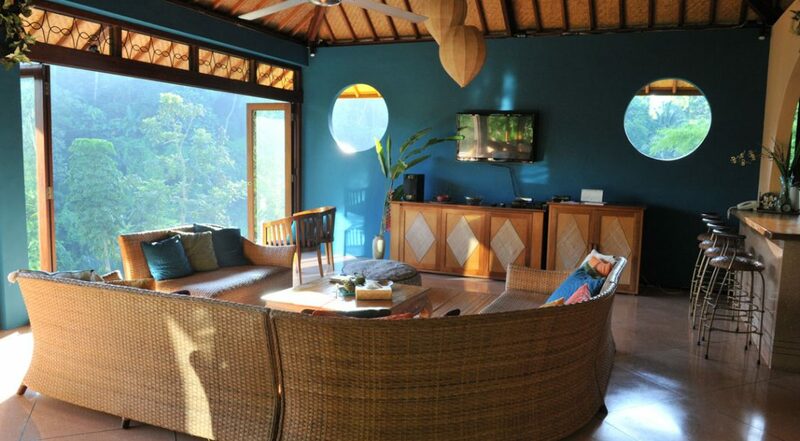 Villa Umah Shanti has a lovely two storey building that overlooks a stunning diamond shaped pool. 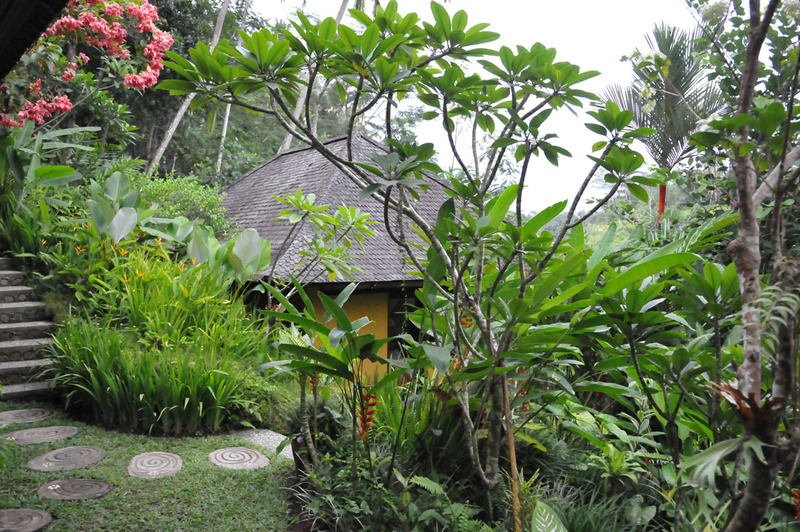 Lush tropical gardens surround the villa, creating a beautiful natural environment that is so relaxing. Guests can stretch on the pool chairs beside the pool, soaking up some sun, enjoying the beauty surrounding them and listening to the soothing sounds of the river below. It is seriously tranquil here. 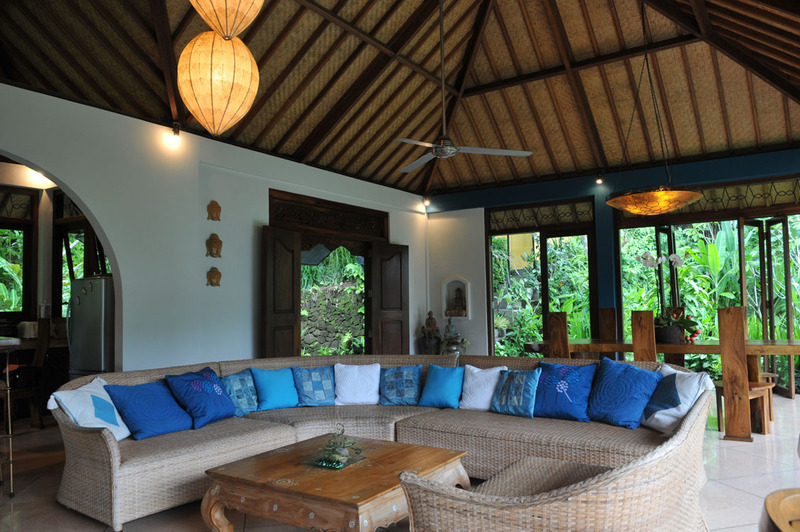 Staying true to its traditional Balinese style and design, the living area of Villa Umah Shanti is simple, stylish and lovely. It is decorated with many Balinese statues and lovely pieces of art. 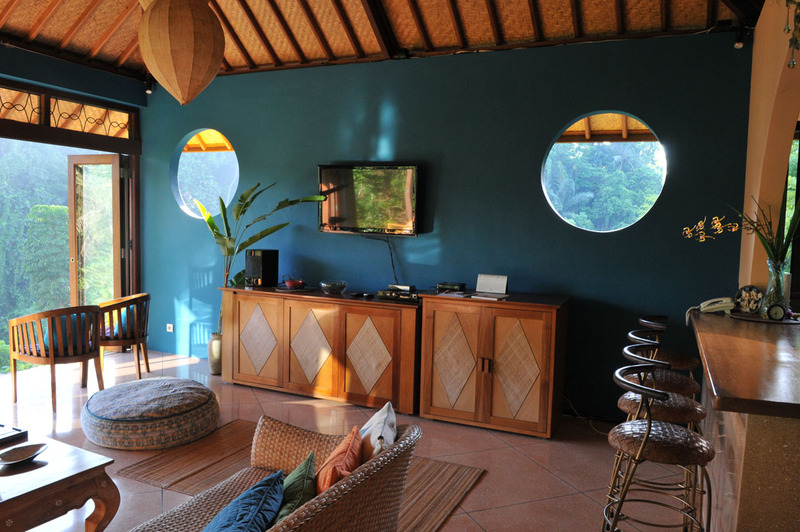 There is a semi-circle shaped rattan sofa set right in the middle of the living room and behind it is a lovely wooden dining set. 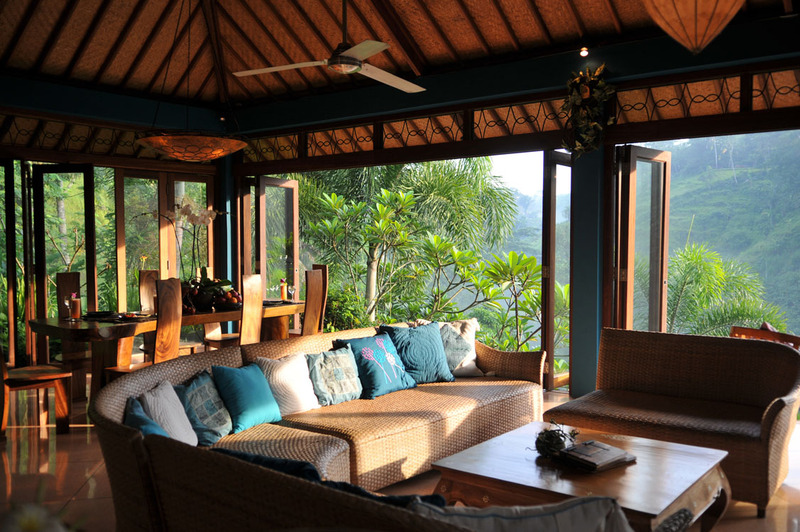 All around the living area are floor to ceiling glass windows offering panoramic views of the beautiful rain forest surrounding the villa. 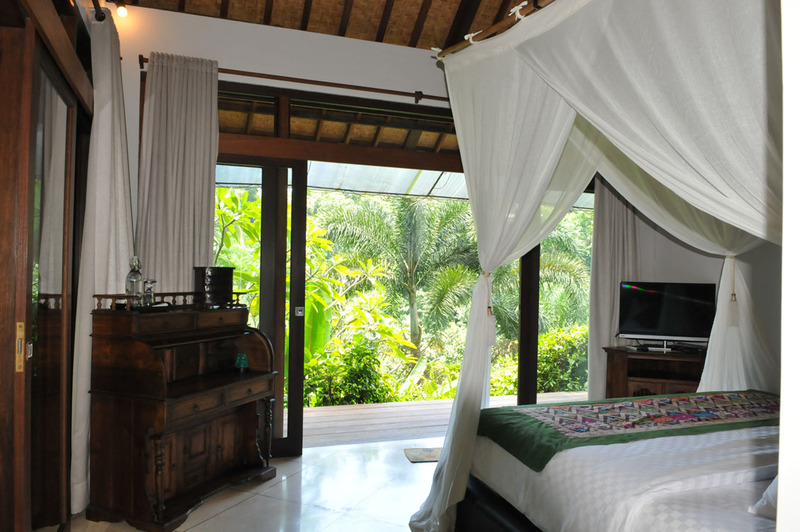 Villa Umah Shanti has three spacious bedrooms which are all elevated and decorated in a beautiful Balinese décor. 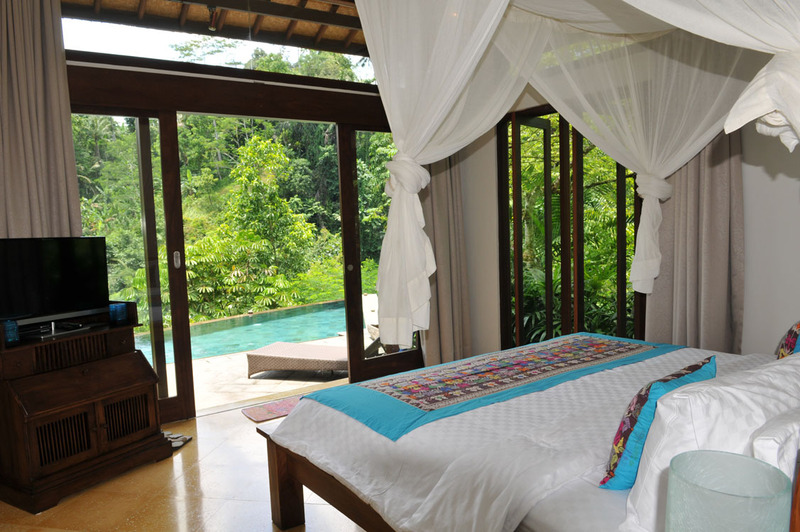 Each bedroom has a king bed facing a sliding glass door that leads out to a wooden patio. 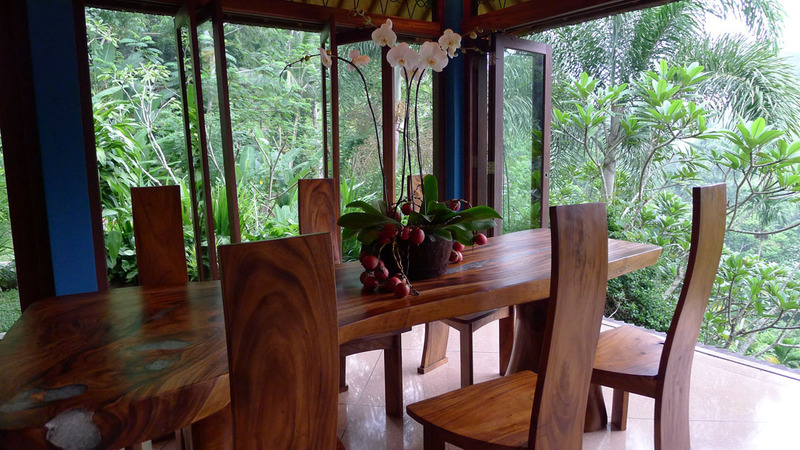 Guests can sit here drinking in the beautiful sights and sounds of the villa. 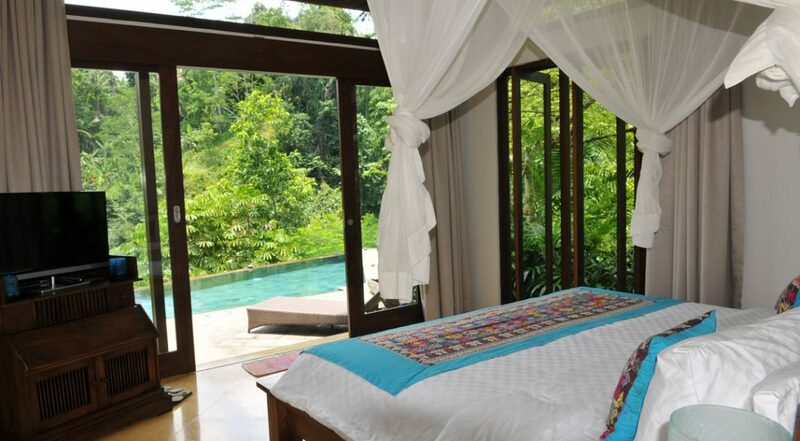 Also, the bedrooms have ornate wooden furniture, a TV and a lovely ensuite rain forest bathroom. 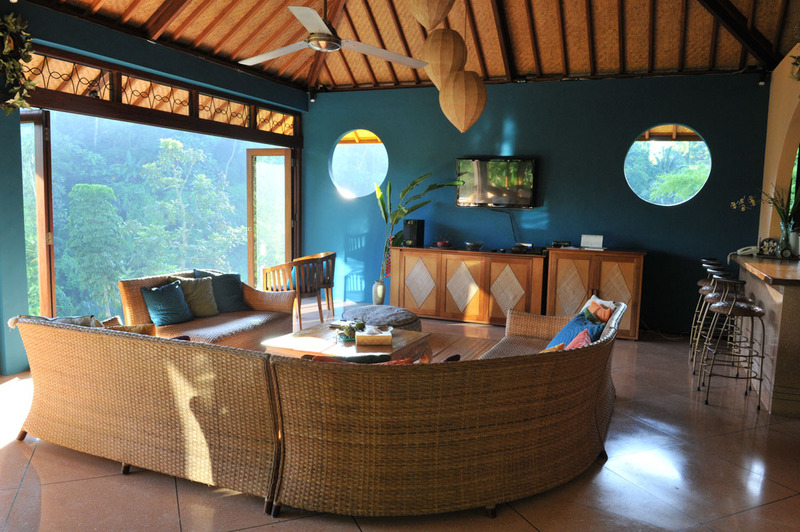 The villa has an efficient manager who will ensure that there are no hitches or glitches throughout your stay. 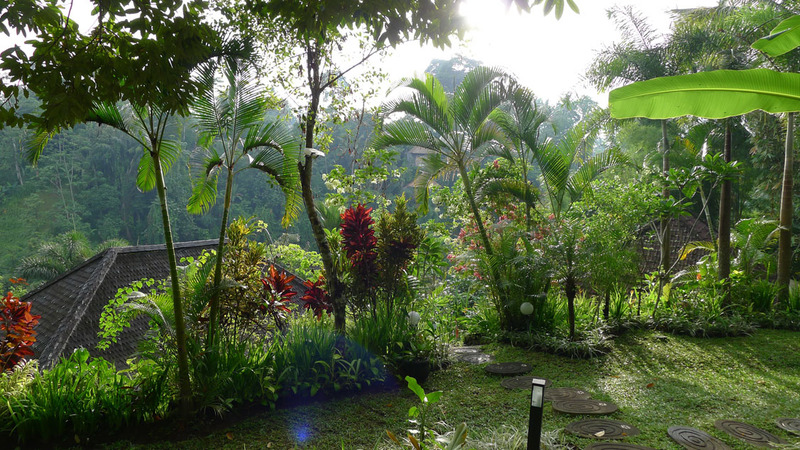 Guests can use the free shuttle service to explore the exciting central Ubud town and get to see all the lovely sights that the villa has to offer. 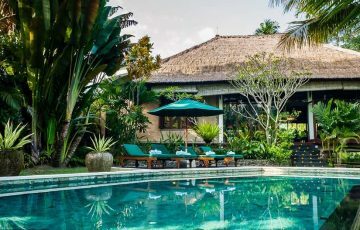 Located 15 minutes away from Central Ubud, Villa Umah Shanti is close to the best restaurants, boutiques, shops, cafes and bars that this area is famous for. Guests will be thrilled by the variety of things to do and see while on holiday in this little slice of paradise. 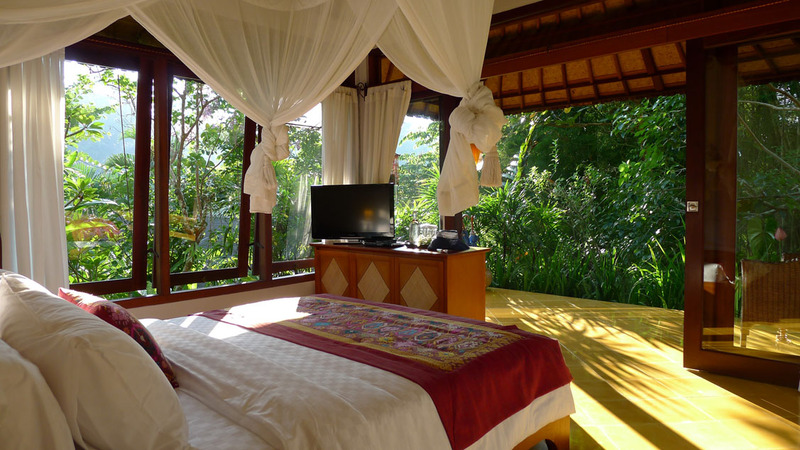 Villa Umah Shanti is neatly placed in a tranquil traditional village where you can watch rustic rural Balinese life and the only sounds you will hear are those of the natural surroundings and the enchanting music of ceremonies at the local village temple. 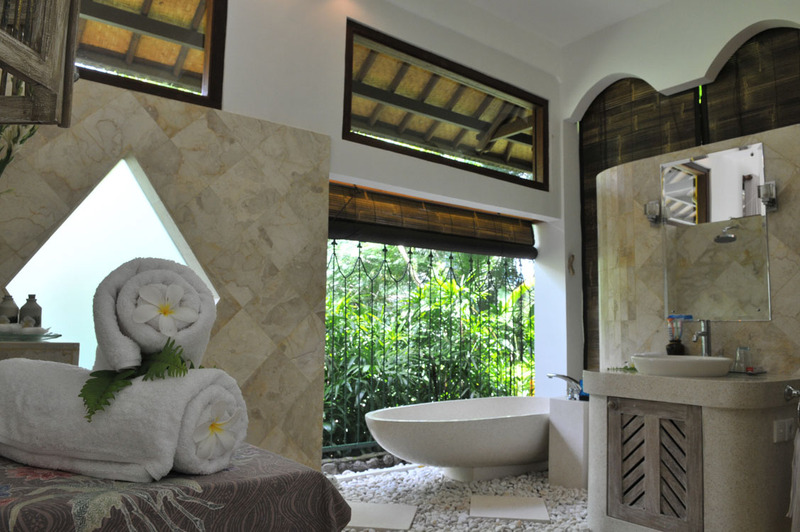 If you want to unwind and feel the spiritual side of Bali then this is the ideal villa for you to get into that zen mode. 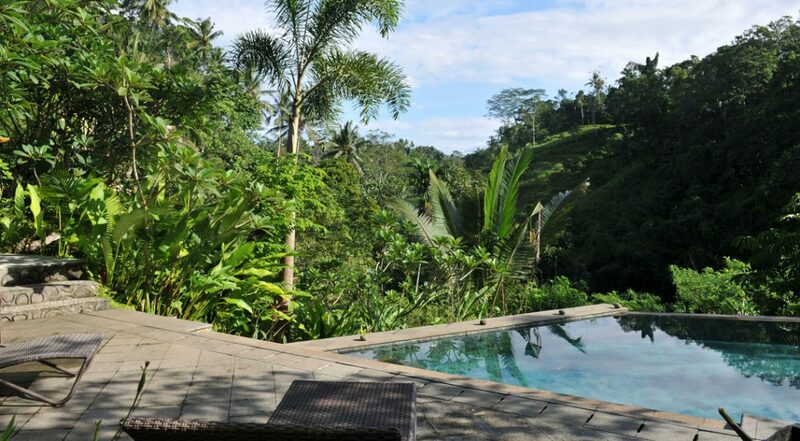 To view other similar 3 bedroom Ubud Villas with sensational views or see more luxury family friendly Bali Villas please browse this website or contact our reservation team. 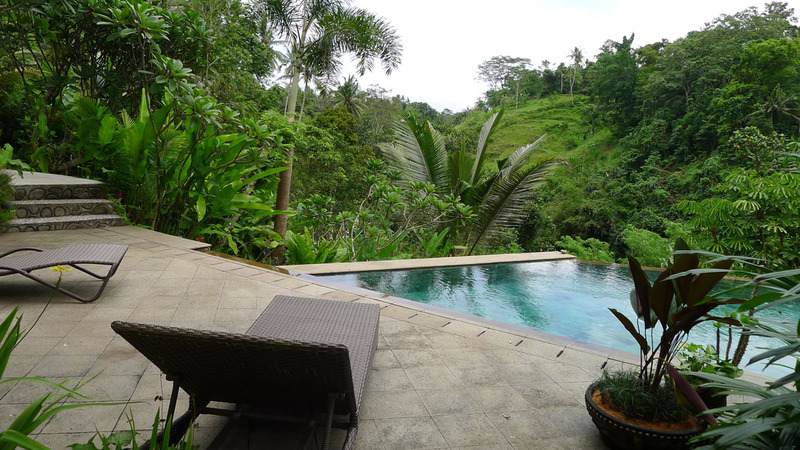 Book your Ubud holiday at Villa Umah Shanti, well in advance as this is a really popular villa especially if your planning a trip to Bali during the Australian school or public holidays. 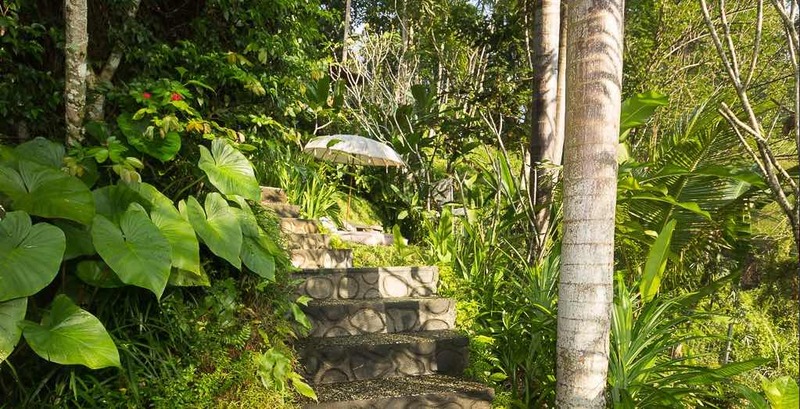 House Manager who will be more than happy to organise tours, dinner reservation, transport, in house spa treatments as well as massages and anything else you may need to make your stay perfect. 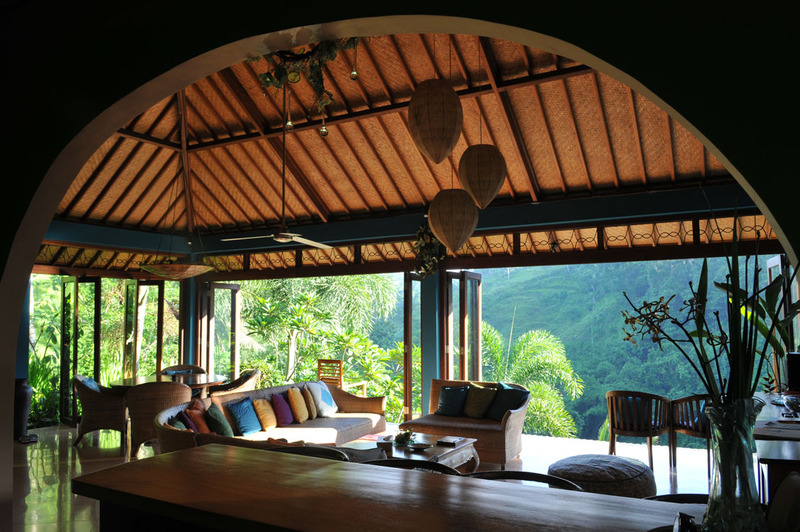 This villa was exactly what the family was looking for - a wonderful and very peaceful location in the heart of rural Balinese countryside. It was extremely laid back and the atmosphere was wonderful. 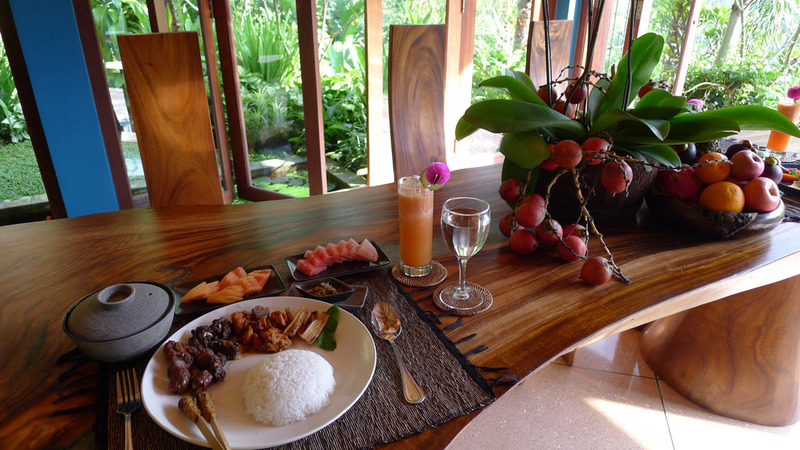 The villa staff were friendly and eager to please with those delicious breakfasts & daily snacks. The rooms were huge and the beds were massive. 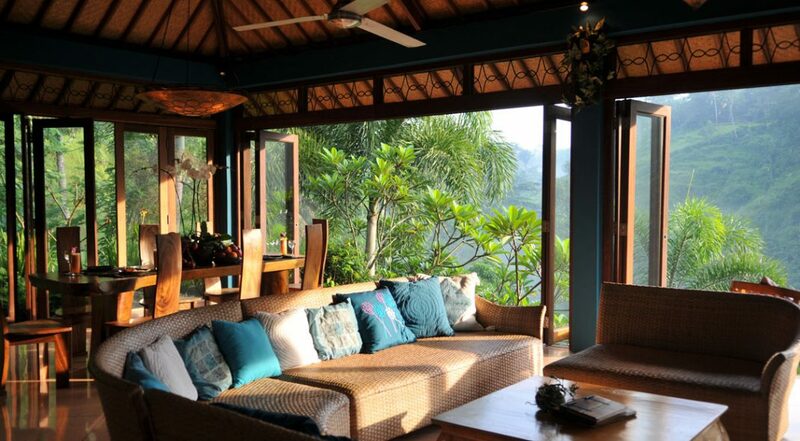 Villa Umah Shanti is pure paradise and we can't wait to get back here again for another week of pure bliss. This is one on those villas that gets a 10 out of 10! What an unbelievable setting - it is actually much better than the photos! 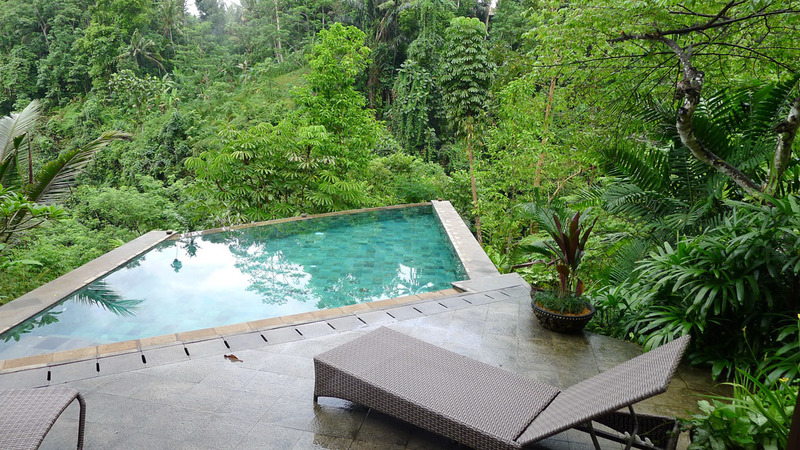 Everything was perfect especially that magnificent pool overlooking the valley. We spent hours there just soaking up the tremendous atmosphere. 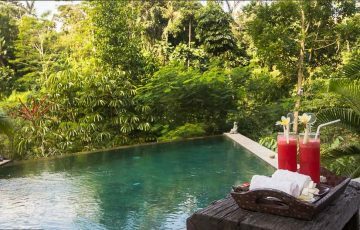 Made & Putu the villa staff were simply fantastic and were always around to make us fresh juices during the day as well as those healthy breakfasts. 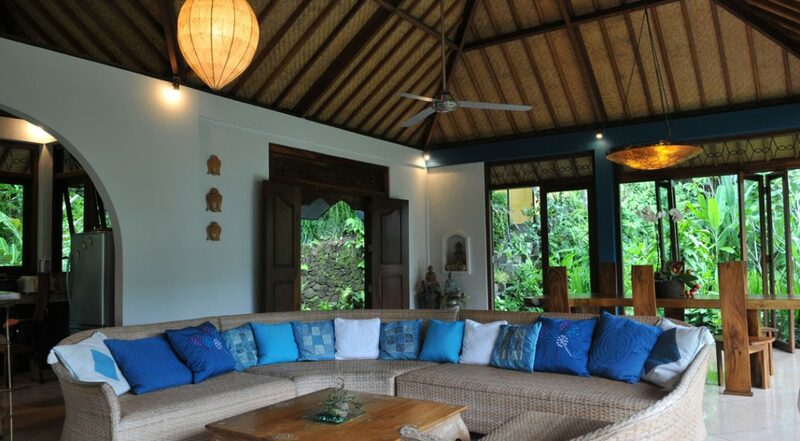 I would recommend this villa to those people wanting a different Balinese villa experience away from the crowds. 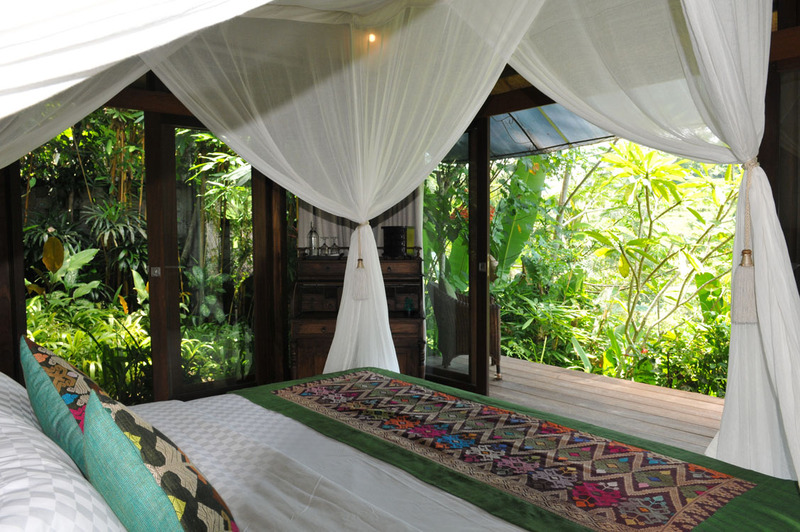 This is all about total relaxation and harmony with nature. Loved every minute here. We came here for the Easter period in 2016 and spent 7 days here in total. 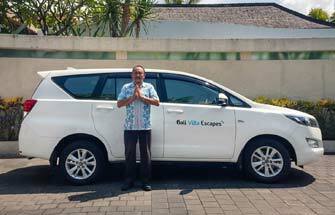 Firstly let me say a huge thanks to the team at Bali Villa Escapes for organising this at such short notice - Yayuk, your a legend. The villa was amazing and the staff were the best! They cooked for us most days and even made a birthday BBQ dinner for my youngest son - what a real treat! The view from the villa was gorgeous and it was lovely to sit and read my book while listening to the river below as well as the natural wildlife - it was really easy to get immersed in this tranquil vibe. The kids loved the pool area and were happy to ply in there most of the day while we watched them. All of the rooms were ideal and large enough so we all had our own space. 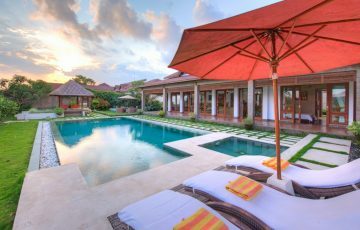 What a perfect villa for our family time here in Bali. 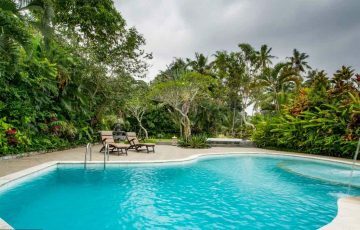 Well worth the money as our family enjoyed this villa and it's surroundings - the staff, pool area and gardens made this an unforgettable experience. 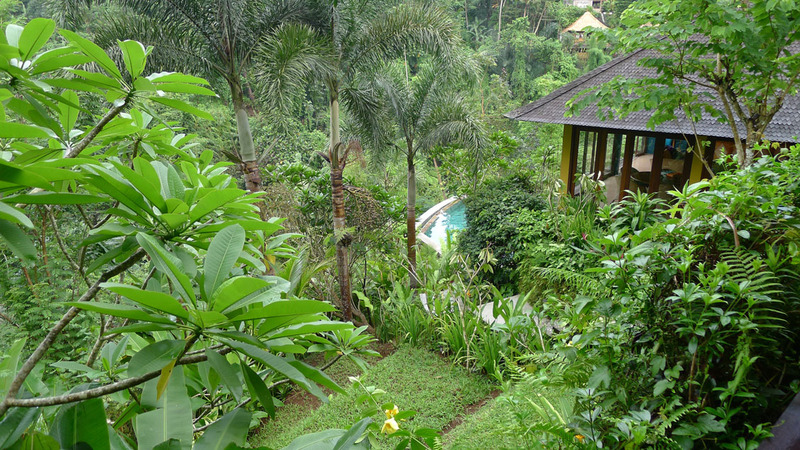 This was our first time in Bali and staying in a villa and we cannot rate it highly enough. All we can say is wow! 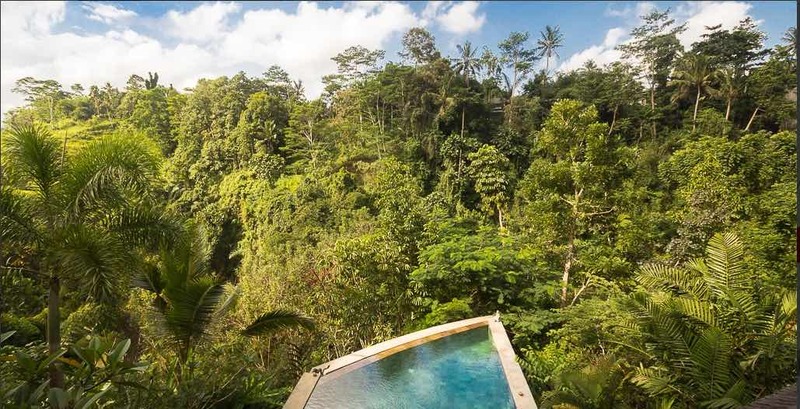 Wonderful location where you are right in the jungle and you get to see a really peaceful and quiet side of Bali - so far from everyone which is exactly what we wanted for our family holiday. Staff were amazing and the breakfasts they made for us were a fabulous way to start the day. Beds we really comfy and the rooms were lovely to come back to at the end of the day. Loved the place and we will be back. In a word: PARADISE. Thanks to everyone at Umah Shanti for an incredible holiday.